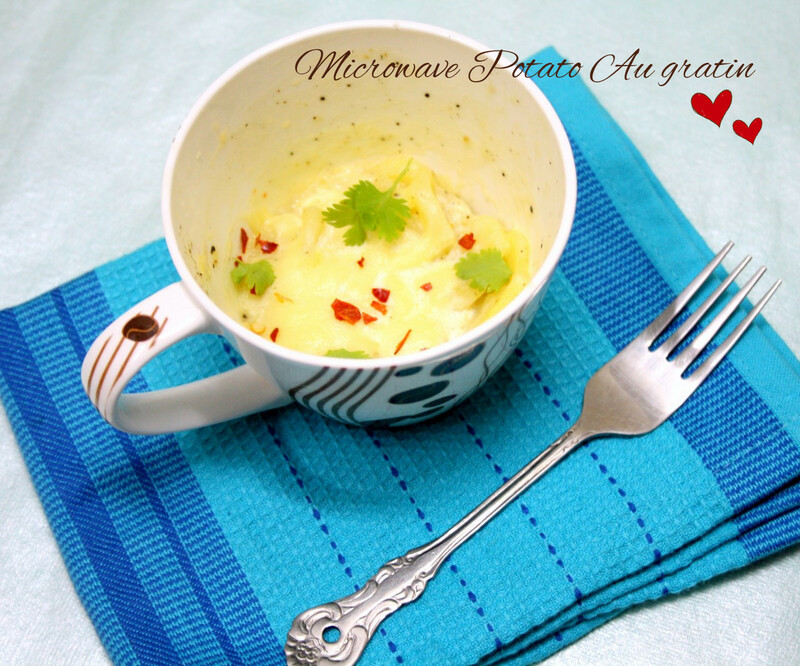 After the Chocolate Cake that can be made in a microwave, I have a simple and quick au gratin made with Potato. While the chocolate cake seem quite lengthy and you might argue that a college kid may not be able to handle so many ingredients, I do agree. I simply thought about the MW part and didn’t check out the ingredient list to be so long. So I will just say that yesterday’s recipe is for microwave method, and may not be so suitable for a college kid to have all those ingredients handy, the process is quite simple still. To make up for that, I have the simplest recipe today, a single serve Potato Au Gratin. Gratin originated in French Cuisine and is prepared in a shallow dish with the ingredients layered and topped with browned crust, grated cheese etc. 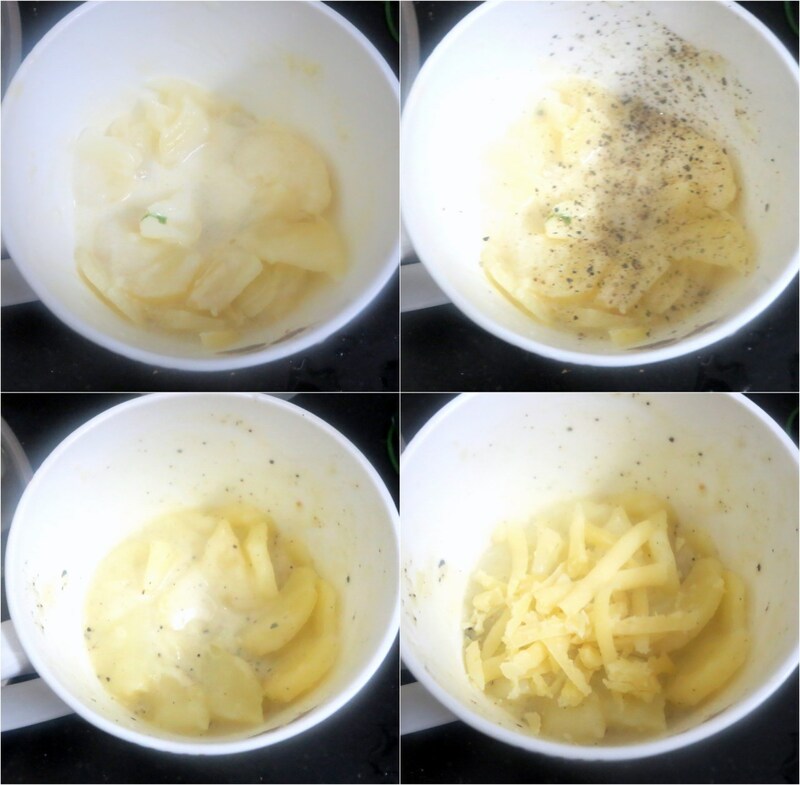 I kept up with the technique and method, though one might say this may not be the actual method of making an au gratin. Still I would simply say to make something so delicious, single serve, when the mood strikes, nothing can become simpler than this. And if you want your kid digging out of your hand, I say you try this! I made it for Konda and she just couldn’t stop herself drooling over the taste. I tasted it too and I couldn’t get beyond the tasting part as nothing was left out. The entire cooking from start to end takes about 6 -7 mins, with MW potato taking about 4 mins and the entire cooking time is about 3 mins. 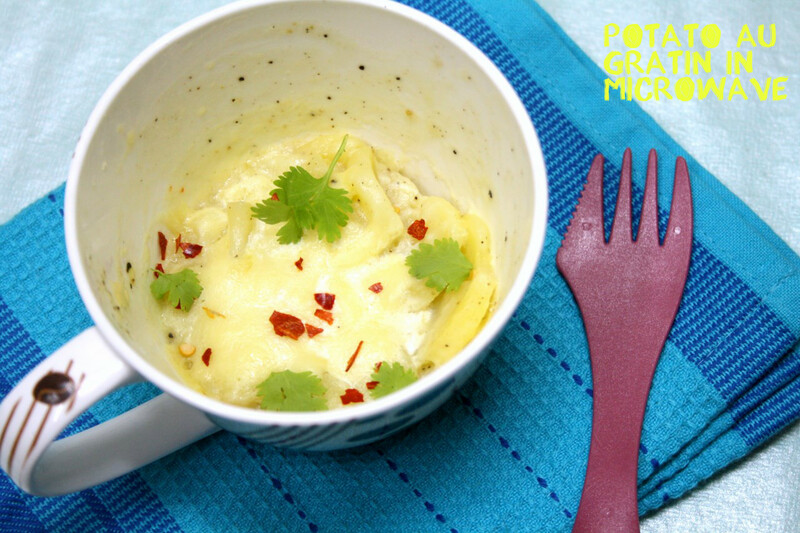 So you have a delicious lip smacking au gratin in less than 10 mins. I have a full blown Vegetable Au Gratin, again in MW method, guess I had decided au gratin works out best in MW mood of cooking. Today’s recipe is so much so easier to make and you can actually ignore the bread crumbs if you want. MW slashed potato for 4 mins. Soak in water and peel the outer skin. 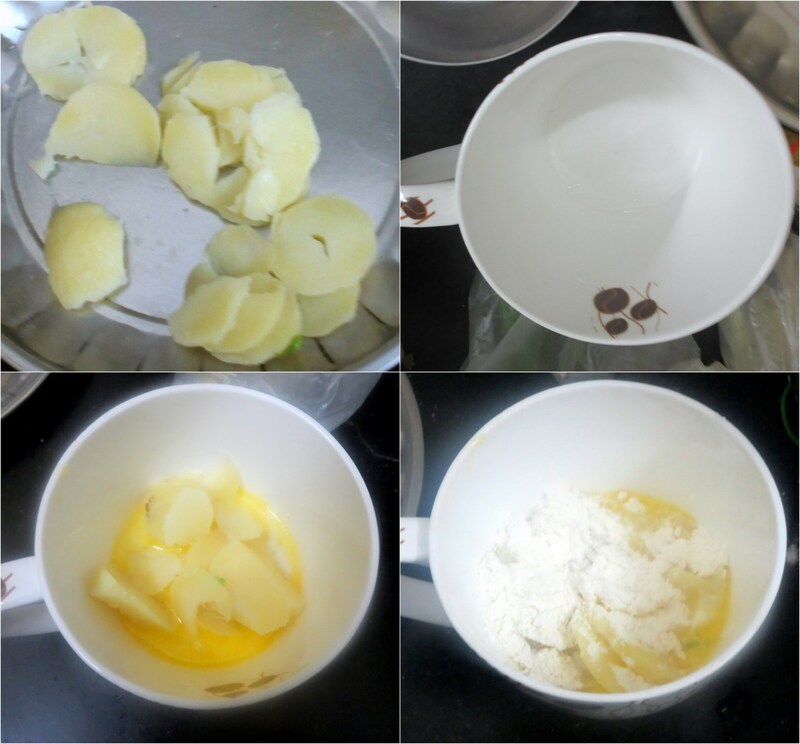 Remove and add the sliced potatoes, all purpose flour, salt and rest of the milk, saving a tablespoon of milk for the final cooking. MW for a minute. remove and mix well. Add grated cheese, bread crumbs if you are adding and a tbsp of milk, sprinkle pepper on top and MW again for a minute. Take precaution before digging in, as the potato will be very hot. You can make it without bread crumbs as well. Total cooking time is only about 2 – 3 mins, depending on your MW. You could sprinkle red chili flakes as well if you want. What a simple and delicious potato gratin recipe. Never thought it can get this easy. Real quick Valli ! 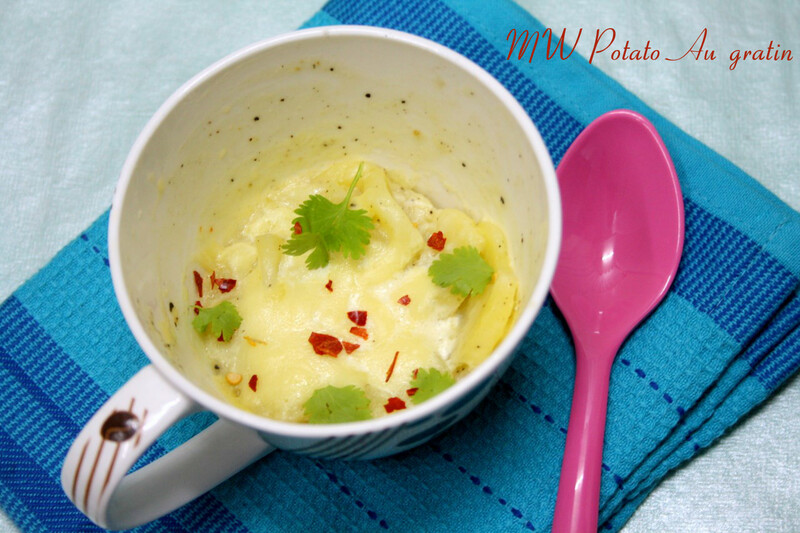 A must try recipe which looks good and of course will taste even better. A quick dish, prefect for single serving.. cant say no to this gratin.